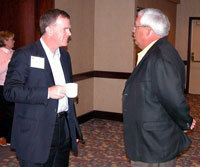 The 2006 Agri-Marketing Conference & Trade Show will be held April 19-21, at the Hyatt Regency Crown Center Hotel in Kansas City. After the last session at the Forum I got to interview John Block, Food Marketing Institute, about his idea of what the next big thing in food marketing would be. 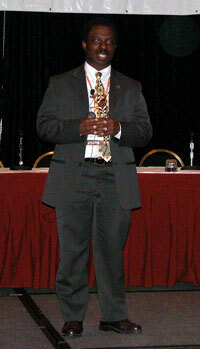 The final session was on Mad Cow, Oil and Fickly Consumers presented by Dr. Vincent Amanor-Boadu. That’s Dr. Vincent if you want to know how to pronounce Amanor-Boadu. He joked that kids ask him if he’s related to Eddie Murphy. He tells him that he is. Dr. Vincent is the Director of the Ag Innovation Center at Kansas State University. I’ll have a little more to offer but this is the end of the conference. Since I took this pictures I thought I ought to post them. Actually I’ll try to find time to create an online photo album of all of them and post it later. More of that thing that really makes this all worth while. Getting to talk with our peers. What better place to do it? This afternoon former U. S. Sec. 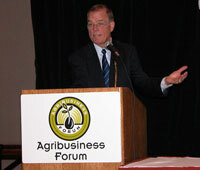 of Agriculture, John Block, Food Marketing Institute, conducted a session on Consumer Food Trends – The Next Big Thing. He said that it’s really difficult to predict what that would be and presented some research on recent consumer patterns and trends. He also moderated a panel with Ellen Kreimendahl, Balls Food and Charlie Bradbury, Nolan Ryan Tender Aged Beef. What would you ask these folks? I’m out in the hall posting this while John’s speaking inside. He must be a broadcaster based on the volume coming out of the room. 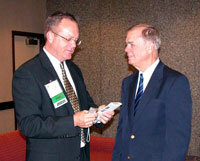 John Phipps hosts U. S. Farm Report and entertained and informed at lunch. At the time of this picture he was talking about memory but I can’t remember why. Here’s a mystery for you to solve. The first person to correctly identify the person who is wearing these shoes wins an AgWired t-shirt! Jill Howard-Allen, Southwest Airlines, had quite a few questions after her presentation. I think that people found her presentation to be very interesting and different than what they expected. The second session of the day was a very interesting look at how Southwest Airlines is using the internet to connect with their customers. The presentation was given by Jill Howard-Allen. It was all about Ding. Do you have Ding? Does that make you a Dinger?